We're "New Antiquarians" in The New York Times!!! 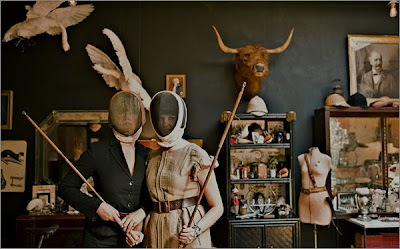 It's not every day that you and your sister, two non-fencers, appear in The New York Times in fencing masks, holding vintage rifle cleaners (these items usually only come out after a few cocktails). We and a few friends were lucky enough to be deemed the "New Antiquarians" for the Thursday Home section...and what fun it is. Countless thanks to reporter Penelope Green for being so kind and writing such a wonderful story that explores all of our homes and collections - and even includes Taavo Somer, ROOT and our mom and dad. Also, Michael Weschler, those are some great pics. Well-timed article. Seeking advice as I work on my LES studio. i just got hit the home section and... POW! i love the piece, and the images gorgeous! What a pleasant surprise to open the NY Times and see you two holding court! Those pictures are fantastic. Congratulations! Hollister and Porter - a great piece and the recognition is well-deserved - what fun! I came across it this morning and just about died it was so stunning! I blogged about it here www.theneotraditionalist.com. Bravo!!! i'm so excited! YAHOO!!!! the photos are INCREDIBLE!!!!! Well done, ladies! Terrific article. Congratulations! I'm so happy that they profiled your fab apartment! Thank you all so, so much! What a fun day! Fantastic--maybe Porter can fence with Don Draper. Congratulations! The images are stunning, but it would take a pretty miserable photographer to make them look any other way. I think that Porter needs more than a walk-on. Read the great NYT article, love your place and your blog...I just found you through Grant K. Gibson's blog list. Oh, and I voted for Porter over at "Mad Men", a show I've never seen because I rarely watch T.V. If Porter is on, maybe I'll watch. Do you know the Wagner Free Institute of Science in Philadelphia? You should! It's one of America's quirkiest museums—a nineteenth century natural science collection still displayed in nineteenth century curatorial style in a classic early nineteenth century building. Plenty of cases packed full of curious specimens with hand written labels and amazing juxtapositions. Congratulations! Great article, amazing honor, well deserved. Wonderful article. The images are simply stunning, as well as the both of you. Well deserved press; incredible photos!!! Wow!! Congrats!!!! The apartment looks fantastic! Congrats! Such fun! We are just thrilled by the story and all the wonderful responses!!! Did you see that Porter is currently in the lead for the Mad Men contest? i just saw this on "cup of joe". u girls have tremendous taste. i love sisters who encourage each others style. It's so fun! And she's still in first place (thanks to all the wonderful bloggers who've been promoting her campaign so sweetly!). I think this might be the first day she hasn't nearly sprained her finger refreshing the leader board. Congratulations mesdames on being NY Times tastemakers! Loved Porter's 'post partum apathy towards an imaginary child'.. Wish I'd said that. I would be SO happy living in your place...could move right in and love it. Excellent article on The Times. A fascinating, curious place you have. Love it! Amazing apartment and great article, always love seeing like minded aesthetics. OMG! Congratualtions!!! well deserved. I'm waiting for the coffee table book. I suspect people will be talking about your apt. for years and years to come. Just wonderful. Congratulations, the article is wonderful! How nice to know there is a name for those of us who like our creepy, dusty old things! So, what I can't in the world figure out is how I've missed you. I must be living in a vacuum. I've got little taxidermy in my shop in Miami and NOBODY gets it. It was so refreshing to consider that I may not be crazy after all. Sometimes I go through all the wonderful design blogs that are all about cleanliness and minimalism and I begin to question my own aesthetic. LOVE your blog and CONGRATULATIONS on the fantastic article. I will certainly be subscribing. wow-you made my heart sing. great article, loved it. congrats! Amazing! So glad I found you two...you're unique, supremely talented & so cool...love the blog too! Well done! it's thanks to this piece that I found your splendid blog! Congratulations ! this article is fantasctic and thanks to it I've discovred you !! I just found your blog from this article and WOW, I am just speechless. I love your style. This past weekend when we were in Austin, there were many items such as taxidermy, etc., all in the shops. I don't know if you ever come out to the Round Top/Warrenton Tx Antique Shows, but if you do, I'd love for you stop by. I'm set at Zapp Hall and carry similar items as you like. I'm adding your blog to mine. We've been saving this article since July! My parents just sold their house in Brooklyn and my mother, who is an interior designer, has some antique and "old style" pieces to unload. For example, there is an antique Dietz kerosene parlor heater with isinglass (I can e-mail photos if you'd like). Would you be interested in stopping by this week to see them? Time's short before the move, but you're not too far away - you might even get a Thanksgiving cookie in the bargain! Please e-mail me at drjah68@aol.com.